Stephenville, Texas UFO - Empire Tribune Writer Silenced!! I'm sure that by now everyone is fully aware of the recent Stephenville UFO sightings, the reason you will know most of what you do is down to the tenacity, integrity and honesty of a reporter for the local paper (The Empire Tribune). I'm talking about, Angelia Joiner (ex-staff writer). Over the course of the last month, Angelia has endeared herself to all of the Texas UFO witnesses by providing them with support, acting as a confidante and giving them a much needed voice by telling their stories in her articles. Here are a couple of emails that Angelia exchanged with the Admin (Bren Burton) of the Open Minds Forum. While Angelia didn't post the messages to the forum personally she gave Bren permission for them to be posted (7th February 2008). "I think my readers would find a lot more of this sort of story interesting but my newspaper doesn't want any more stories. My boss feels it's time to move on. A city councilman here talked to the Star-Telegram and said the whole thing was an embarrassment to the town (or something to that effect.). I joined your group because I was so impressed with how nice the men were to offer to help Ricky Sorrells. I don't know how that went yesterday but I could see they were sincerely concerned about him and his situation. That was impressive and I like people that care about others. [...] I don't want to say anything bad about the newspaper. They are just not interested any more. But it was a record sales month in the history of the E-T for JAN. so I feel good about that. It's funny how one day I was sitting on top of a huge global story and practically the next I'm looking for a job. Life...it's full of surprises. And, I think that's a good thing. Here's hoping there is something better around the corner. "I gave two weeks notice but this morning they had confiscated my computer and I was told to pack up and get out. I'm devastated and still in shock. I was trying to direct people away from talking to me about UFOs and other information during work hours and I had forwarded emails to my home computer so I would not be dealing with that on newspaper time. But, apparently that wasn't the right thing to do either. I've just been between a rock and a hard spot if you know what I mean. The publisher said she didn't want me to leave with ill feelings toward the newspaper and I'm trying not to. I'm grateful for the opportunity the newspaper gave me in employing me as a writer. I have only been writing for them 18 months and I've learned a lot but I still have a lot more to learn." At least three pilots in Stephenville disagree with the military's press release issued Wednesday. Steve Allen, Don “Doc” Stewart and Todd Downs all say if Stephenville and the Selden area are in the Brownwood Military Operating Area, it's news to them. If anyone in the world hasn't heard of Stephenville , Texas , it could only be for one reason - they're not listening. Stephenville continues to capture national and international attention with news crews coming from all over the world. Last weekend, a Brazilian news crew came, while another is expected to come from Japan . Science club shirts are a hit! Ricky Sorrells is frustrated and a little angry. Since his interview with the Associated Press, Sorrells has stayed quiet regarding the daytime UFO sightings on his property near Dublin . And, there is more than one reason for his silence. Sorrells believes military officials have been harassing him by flying military aircraft over his property at low altitudes, at all hours of the day and night. Sorrells runs livestock on his place and said the cattle don't react well to the disturbances. It's also been hard to get any sleep. Answers: Ricky Sorrells just wants answers. And, in light of what he's been through, it doesn't seem to be a lot to ask. Witnessing an unidentified flying object four times since the beginning of the new year, then having military aircraft whizzing over his land and disrupting his sleep and livestock, followed by a string of mysterious phone calls and in person encounters from individuals demanding he “shut up” about what he saw, and landing unexpectedly in the international spotlight, has taken a toll on the 37-year-old man accustomed to the simple life. To be fair, the last article (Don't look, Ethel!) 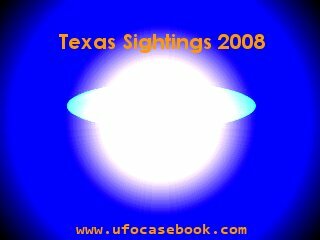 doesn't dispute any of the earlier evidence, nor does it disagree that something was definitely witnessed in the skies over Texas, but what it does do is present the events in what is presumably thought to be from a less confrontational viewpoint. It's this diluted, trivialised style of presentation that has served only to add the, “Giggle factor” to media reports on the UFO phenomenon and further detract what from the real issues and further destroy what little credibility the subject currently has. I should also point out that NO references are made to any of the original witnesses, and perhaps more noticeably there's no reference to the plight of Ricky Sorrells. The last two stories about the UFO incident that Angelia Joiner had published were direct witness statements relating to how Ricky Sorrels was being subjected to cowardly, underhand and despicable scare tactics in an effort to intimidate him by (one can only assume) whichever faction of the government and/or military deals with harassing innocent citizens. The articles reported facts that included low flying military craft over his property at all hours, strange and threatening telephone calls from people who knew more that they would tell and made threats like, “Son, we have the same calibre weapons as you do but a lot more of them.” Also shadowy figures making themselves known on his property in the middle of the night. (It is thought that the shadowy figure left a little message for Ricky in the form of a bullet as it was found at the spot the stranger was lurking). If ever it sounded like someone needed reassurance and a way to voice his experiences, it was Ricky Sorrells. I don't doubt for a second that the decision to confiscate her computer and ask her to leave the premises had nothing to do with her immediate superiors other than their compliancy with whomever applied the pressure, that still in no way absolves them of blame, neither does it justify their actions in any way, shape or form. If the letters section of the Empire Tribune is any reliable gauge of the feelings of the readership then they seem to not only be embracing the current situation but they are positively enthusiastic about it. Need a little good news today? Well, it has come from your very own hometown. In a world beset by an unrelenting stream of bad things from Baghdad to Wall Street, Stephenville somehow brought a smile to the world at large. With the recent UFO sightings in these parts, the average person could grin for a brief moment and then wonder about the possibilities of the universe. Whether you believe that we are alone or not in this vast cosmos is not the point. It's how we reacted to the moment. If people all around the globe, hearing of what one little town deep in the heart of Texas experienced, looked up into their night sky and perhaps pondered, however briefly, that we are all not that much different, good for us. If one little speck on the world map could perhaps embrace something from another world, there is hope. Evidently their soaring sales, massive spike in web activity and encouraging a greater sense of community within their readership doesn't mean a great deal. This certainly begs the question of exactly which agenda are they working from as they obviously aren't aiming for increased sales and they don't appear to be listening to or accommodating the wishes of their readership, the good people of Stephenville. Remember Angelia Joiner was just the messenger, doing the job she was paid to do, the job she was asked to do. Because she doesn't compromise her ethics, because Angelia Joiner genuinely cares about the witnesses (and what happens to them AFTER they talk to her) because she strives for the truth so that she may share it with us all, it seems that the these traits make her an expendable asset, when it should really make her indispensable to all except the most corrupt and biased of organisations, but more than that, these traits should make people like Angela Joiner a necessity. In fact, if these are not the character traits that the Empire Tribune actively encourages and demands from their staff, what traits exactly do they feel are becoming of a reporter? What could they be if not integrity, loyalty and honesty? And more importantly why should anyone trust anything that is printed by a media organisation whose ethics, values and morals are not only flexible but apparently negotiable? Whether you've followed the story since the start, only read one or two articles, or if this recent debacle is your introduction to it, I urge you to contact the publisher and the editor at the Empire Tribune and voice your concerns at their decision to silence Angelia Joiner and consequently silence the Stephenville community. They need to know that this unwarranted suppression hasn't gone unnoticed, let them know that their actions are under public scrutiny as they should be, and let them know that ultimately they are accountable for their own decisions.